32 roses, birthday this year is 32 years old. This bouquet is the perfect gift. 32 roses, birthday this year is thirty-two years old. This bouquet is the perfect gift. Order 32 roses online and we will deliver to the door, no matter where they are in Thailand. 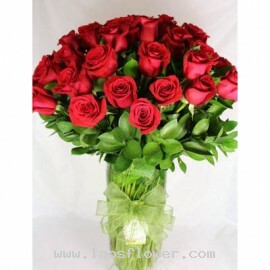 32 roses bouquet consist of 17 red roses and 15 pink roses arrange in round shape accent with pink flowers. Wrapped in white & cream paper and tied with ribbon. Roses color and material can be changed according to customer requirements. Please tell us when ordering. Occasionally, substitution..
32 red roses arranged in a clear glass vase accents with green leaves and tied with green ribbon. The color of roses can be replaced. Please request when ordering. Occasionally, substitutions may be necessary to create your bouquet due to the availability of certain flowers in various parts of th..
A bouquet of 32 roses consists of 10 red roses, 10 white roses, and 12 pink roses accent with white gypsophila. Wrapped in green paper and adorned with a ribbon. The color roses and materials used can be changed. Occasionally, substitutions may be necessary to create your bouquet due to the avail..